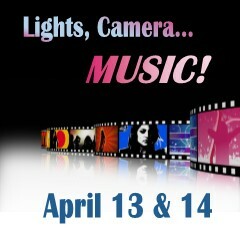 GRAND SINGERS AND CHORALE SPRING CONCERT "Lights, Camera…MUSIC!" Come celebrate the sounds of the movies with the 144-voice Chorus and 32-voice Chorale, under the direction of Pamela J. Weir. The concert will open with “Hooray for Hollywood” from the 1937 movie Hollywood Hotel, a familiar song featured in every Academy Awards ceremony. Also included will be many more new arrangements of familiar songs from movies such as “As Time Goes By” from Casablanca (1942), “Diamonds are a Girl’s Best Friend” from Gentlemen Prefer Blondes (1953), “And All That Jazz” from the musical Chicago (1975) and the movie (1979 & 2002)and “Make Someone Happy” from Sleepless in Seattle (1993). You’re sure to sing along with “Ding-Dong! The Witch is Dead” from The Wizard of Oz (1939) and remember all of the James Bond movies watched while listening to the “James Bond Theme.” Don’t miss the spring concerts – tickets go on sale on February 1st, so mark your calendar now! $12.00/person; Performance Sat. 7 p.m., Sun. 3 p.m. Sonoran Plaza.